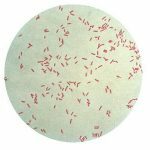 How to prevent bacterial infections associated with poor hygiene in hospitals, nursing homes and day care centers has become a necessary though rarely pleasant topic for healthcare providers. Every year, an estimated 5 percent of all hospitalized Americans, or about 1.7 million, are treated for a healthcare-associated infection. About 90,000 of them die, according to numbers reported by the Centers for Disease Control and Prevention. 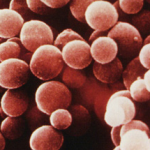 The infections are caused by multiple bacteria that can be traced back to healthcare settings and 14 percent involve a superbug, methicillin-resistant staphylococcus aureus or MRSA. 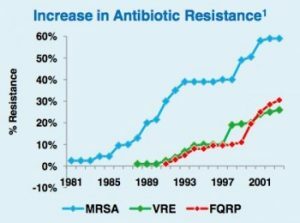 After rising rapidly in the 1990s, the number of MRSA cases began to decrease in the past decade, but following in MRSA’s footsteps are superbug wannabes such as floroquinolone-resistant pseudomonas aeruginosa (FQRP), vancomycin-resistant enterococci (VRE) and clostridium difficile, a bacterium that wreaks havoc after antibiotics wipe out healthy gut flora. Efforts to reduce healthcare-associated infections received boosts in the past few years. In 2008, the Centers for Medicare and Medicaid Services stopped paying hospitals for infections they considered “serious complications that should never occur in a hospital” and private health insurers began to follow suit. The following year, the federal stimulus bill provided states with about $50 million to establish surveillance and prevention programs. North Carolina’s state plan to monitor and prevent healthcare-associated infections, which took effect in January and relies on voluntary reporting, is such a program. “It’s not inevitable that you go into the [intensive care unit] and you get a [central line-associated] bloodstream infection,” said Dr. Megan Davies, chief of the N.C. Division of Public Health’s epidemiology section. Davies was one of five infectious disease experts in the Research Triangle who addressed healthcare-associated infections and the rogues gallery of multi-drug resistant bacteria. The Feb. 22 panel discussion was put together by Duke University and Becton Dickinson, a New Jersey-based medical instruments company whose corporate innovation center is in Research Triangle Park. Healthcare-associated infections add an estimated $28 billion to $33 billion in national healthcare costs every year, according to a report the CDC published in 2009. Avoidable infections can enter the body at a surgical site or through a catheter, a ventilator or a central line used to supply medication, blood and fluids directly into the bloodstream. In North Carolina, large programs to collect infection data and improve infection control have existed since 1997: the Statewide Program for Infection Control and Epidemiology, or SPICE, at the University of North Carolina School of Medicine and the Duke Infection Control Outreach Network, or DICON, that linked the Duke University School of Medicine and 39 community hospitals. Central line-associated bloodstream infections and cases involving MRSA have decreased in the past decade due to efforts by SPICE and DICON. But direct costs from dealing with healthcare-associated infections statewide are estimated to still exceed $280 million per year, according to the N.C. Department of Health and Human Services. Innovations to prevent these infections such as special cleaning and medical supplies exist, said William Rutala, director of SPICE and one of the five infectious disease experts on the panel. But better compliance with more basic prevention tools such a hand hygiene would be an important first step. Only an average 40 percent of healthcare workers washed their hands in accordance with CDC guidelines, studies conducted in the 1990s showed. And other studies show that only about one-third of the surfaces at high risk of harboring infectious bacteria in hospital rooms were thoroughly cleaned before new patients came in, Rutala said. 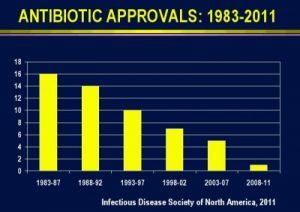 Fewer and fewer new antibiotics to battle the multi-drug resistant bacteria is yet another problem, said Dr. David Weber, associate chief of staff at UNC Health Care who was another infectious disease expert on the panel. Years of antibiotic overuse and patients cutting short antibiotic treatments are driving forces behind the rogues gallery – not only in healthcare settings but maybe also in livestock farming. About two-thirds of the MRSA central-line bloodstream infections in hospitals involve bacteria that came from outside the hospital but whose origin isn’t clear, according to Dr. Vance Fowler, an infectious disease specialist at Duke University. Antibiotics are used extensively to promote growth in livestock farming, said Jorge Ferreira, a graduate student at the N.C. state University College of Veterinary Medicine. Daily use of antibiotics is also normal in dairy cows. 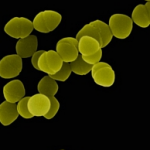 Fowler and Ferreira are collaborating on research to find out more about MRSA and whether the superbug is transmitted from animals to humans. They presented some of their findings as part of a panel discussion at the N.C. Biotechnology Center in RTP, a few hours after the infectious disease panel met in Durham. So far, Ferreira reported, MRSA strains have been found in pigs, cows, dogs, cats and even hamsters. Check out our articles about where to buy industrial autoclaves and other new interesting posts. Learn more about laboratory equipment through scienceinthetriangle.